As you are aware, I am a huge fan of Aftelier Perfumes, and I am in awe of Mandy Aftel's artistry. Mandy is a woman of many talents, and among her many achievements is her long list of publications. Mandy is a gifted writer, and everything that she writes is a great pleasure to read. As an unexpected gift, she sent me a copy of her book Essence & Alchemy: A Natural History of Perfume, and this is a must-have must-read for anyone interested in the history of perfume. 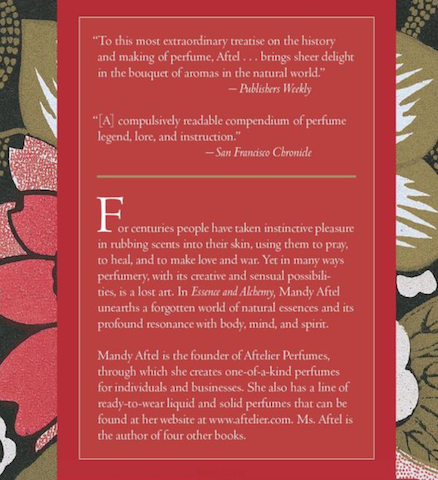 "Mandy Aftel resurrects the rich legacy that is entwined with the evolution of perfumery, from the dramas of the spice trade to the quests of the alchemists. She unearths a forgotten world in which scent was celebrated by poets, contemplated by philosophers, and universally appreciated for its profound resonance with body, mind, and soul." "Smelling her extraordinary collection of oils took me to beautiful places I have never been before. The fragrance that Mandy Aftel blended exclusively for me is full of citrus and herbal fragrances that complement my culinary life." "Reading Mandy Aftel on perfume is like listening to Mozart on original instruments-it’s a revelation of tone and technique. She captures the sensuous pleasure of working with fragrance oils and the intellectual delight of composing in scent. Her book combines a perfumer’s sensibility with the authority of a historian and the passion of an enthusiast."